I was recently sent the Influenster Sugar 'n Spice VoxBox. I am a little behind on getting this post up because of family reasons but I wanted to share these awesome products with you all nonetheless. So the first thing I spotted was the Colgate Optic White products. How could I miss them, they are red and white! So when I tried these out I have to be completely honest, I don't like the taste of the toothpaste or the mouthwash. Now my husband likes the toothpaste but also did not like the mouthwash. This product is suppose to whiten teeth up to three shades lighter in one week. I noticed a slight difference but I also have bad teeth. I will say I absolutely LOVE the toothbrush, it gets my teeth so clean. I will be purchasing more of them in the near future. There were also the Splenda NECTRESSE sweetener, belVita Breakfast Biscuits, Dickinson's Witch Hazel Oil Controlling Towelettes (including a $2 off coupon) and last but not least the Vaseline Spray & Go Moisturizer. Okay so to make this short and to the point. The belVita Breakfast Biscuits were surprising good. They had a nice crunch to them and I enjoyed them. I cannot try the NECTRESSE sweetener as I cannot have any artificial sugar, it does say it is 100% natural and made from monk fruit but I am too scared to try it. Maybe I will open a packet and try it in some iced tea, we'll see. So the Dickinson's Witch Hazel Oil Controlling Towelettes are awesome! I love them and plan on purchasing more in the near future as well as looking into their other products. These towelettes were refreshing and I would love many more boxes of them. Last I had to include this photo of my daughter, Olivia, modeling how to use the Vaseline Spray & Go Moisturizer. She is just too adorable and she is a huge fan of the moisturizer just like her Mom! She likes giving her opinions in my reviews and she said, "The moisturizer sprays evenly, absorbs really good and now this spray is mine!" Ha! We're still sharing it, but I am happy to say all 4 of us girls in the house love to use it. Great product Vaseline! 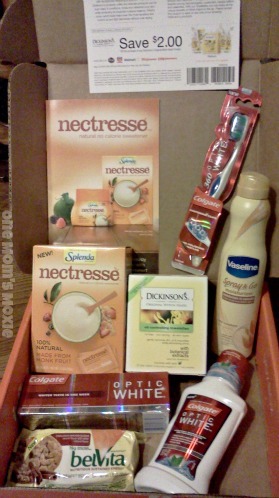 I just received the Spring Fever VoxBox from Influenster. I absolutely love being a member of Influenster and getting to try so many cool new products! The Vaseline Spray & Go Moisturizer sounds like something I definitely need to give a try.